Somewhere in between the lines that someone else drew for me to color in and the expanse of space that exists outside that structure. I have found a lot of beauty in both places, and I see the benefit to people living completely in one space or the other. But for me, I feel comfortable skirting the line and exploring the untamed space a bit. I know what exists inside those lines and how to use that space. However, a huge hang up for me in the past decade or so has been letting go of coloring inside the lines. I don’t want to come off as pretentious or weird being like “I LIVE OUTSIDE THE BOUNDARIES MAAAAAN!! !” I have done a lot of exploring in my life outside the boundaries that were expected of me, to my benefit and detriment. 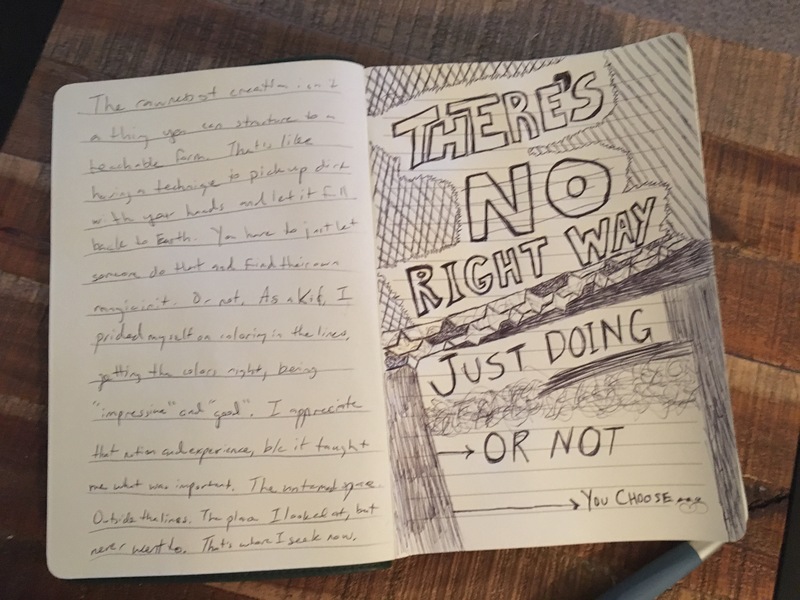 But, in my creative life and in my personal life I’ve worried WAY too much about what the “right” thing or way to do that thing is. And, what I’ve found is that there just simply isn’t a right way. There’s simply whether I actually go about doing something or not. And, that is the goal I’m constantly seeking outside the lines is to simply Do.